All health care professionals involved in surgical procedures, including: surgeons, surgical technicians, anesthesiologists, anesthesiologist assistants, certified registered nurse anesthetists (CRNA), physician assistants, nurses, etc. Health care facility staff responsible for patient safety and risk management. The FDA is reminding health care professionals and health care facility staff of factors that increase the risk of surgical fires on or near a patient. The FDA is also recommending practices to reduce these fires from occurring, including the safe use of medical devices and products commonly used during surgical procedures. Health care professionals and staff who perform surgical procedures should be trained in practices to reduce surgical fires. Training should include factors that increase the risk of surgical fires, how to manage fires that do occur, periodic fire drills, how to use carbon dioxide (CO2) fire extinguishers near or on patients, and evacuation procedures. A fire risk assessment at the beginning of each surgical procedure. Be aware the highest risk procedures involve an ignition source, delivery of supplemental oxygen, and use of an ignition source near the oxygen (e.g., head, neck, or upper chest surgery). Encourage communication among surgical team members. Ensure communication exists between the anesthesia professional delivering medical gases, the surgeon controlling the ignition source, and the operating room staff applying skin preparation agents and drapes. 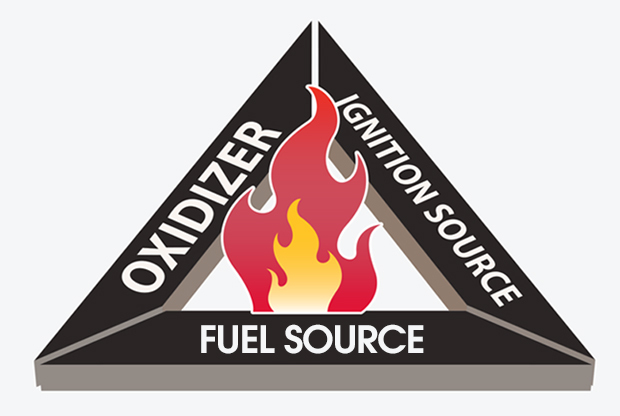 Safe use and administration of oxidizers. Evaluate if supplemental oxygen is needed for your patient. Any increase in oxygen concentration in the surgical field increases the chance of fire. At concentrations of approximately 30 percent, a spark or heat can ignite a fuel source. Titrate to the minimum concentration of oxygen needed to maintain adequate oxygen saturation for your patient. When appropriate and possible, use a closed oxygen delivery system. If using an open delivery system, take additional precautions to exclude oxygen and flammable/combustible gases from the operative field, such as draping techniques that avoid accumulation of oxygen in the surgical field. Safe use of any devices that may serve as an ignition source. Consider alternatives to using an ignition source for surgery of the head, neck, and upper chest if high concentrations of supplemental oxygen (greater than 30 percent) are being delivered. If an ignition source must be used, be aware that it is safer to do so after allowing time for the oxygen concentration in the room to decrease. It may take several minutes for a reduction of oxygen concentration in the area even after stopping the gas or lowering its concentration. Inspect all instruments for evidence of insulation failure (device, wires, and connections) prior to use. Do not use if any defects are found. Do not activate when near or in contact with other instruments. Use a return electrode monitoring system. Tips of cautery instruments should be kept clean and free of char and tissue. When not in use, place ignition sources, such as ESUs, electrocautery devices, fiber-optic illumination light sources and lasers in a designated area away from the patient (e.g., in a holster or a safety cover) and notdirectly on the patient or surgical drapes. Recognize that other items that generate heat, including drills and burrs, argon beam coagulators, and fiber-optic illuminators, can also serve as potential ignition sources. Safe use of surgical suite items that may serve as a fuel source. Allow adequate drying time and prevent alcohol-based antiseptics from pooling during skin preparation and assess for pooling or other moisture to ensure dry conditions prior to draping. Use the appropriate size applicator for the surgical site. For example, do not use large (e.g., 26mL) applicators for head and neck cases. Products made of plastics including some endotracheal tubes, laryngeal masks, and suction catheters. Patient-related sources such as hair and gastrointestinal gases. Plan and practice how to manage a surgical fire. Stop the main source of ignition. Turn off the flow of flammable gas; unplug electrical devices that may be involved. Extinguish the fire –Use a safe method to smother the fire such as, water or saline, and a CO2 or other extinguisher if the fire persists. Remove all drapes and burning materials and assess for evidence of smoldering materials. For airway fires, disconnect the patient from the breathing circuit, and remove the tracheal tube. Move the patient to a safe environment. Reestablish the airway to resume respiratory care. Review the fire scene and remove all possible sources of flammable materials.